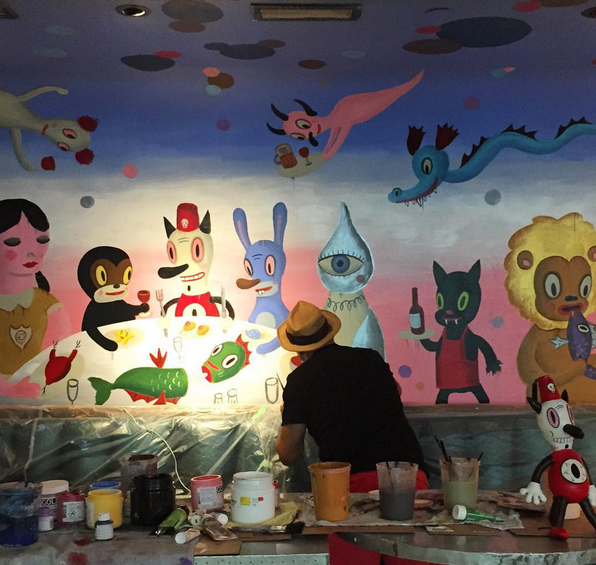 The art of Gary Baseman will be on display at Drake One Fifty in Toronto, Canada for a year starting on September 10th through a multifaceted installation that will entice guests to enjoy their leisurely experiences with visual whimsical delights. Continuing his longstanding exploration of “the beauty of the bittersweetness of life,” the exhibition will feature Baseman’s trademark characters, including Toby, the adventurous cat that is a best friend, travel companion, and keeper of secrets. For the restaurant, Baseman will paint a site-speciﬁc mural, as well as assemble and create images that address the varied and rich experiences with food – Toby’s Secret Society toy series photographs, reproductions of Baseman’s sketchbook drawings of dining around the globe, and other original art that shows the value of breaking bread with business colleagues, friends, and family. Celebration, most of all, is at the heart of Baseman’s imagery and sculptural installations – mixing sweet and savory, humor and sophistication. Baseman’s aim is to create an environment that helps people relax, enjoy themselves and each other, and the atmosphere in which they gather and celebrate life.